Is any kind of store more important to a writer than bookstores? Absolutely not! That’s why I’m writing this series on bookstores I love. 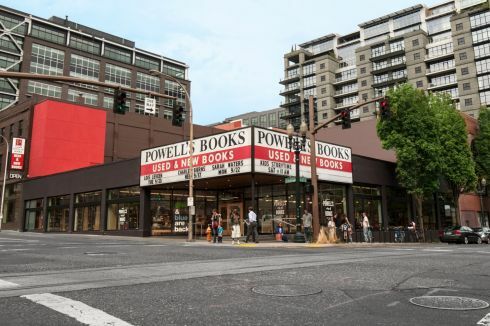 Powell’s is the largest independent used and new bookstore in the world, with over a million books at their flagship location in downtown Portland. It may not look big in the picture, but it fills every single building in its square block. If bigger is better, then Powell’s is the best. I dare you to take in the whole store on one visit. I just dare you! You’ll need a map to find your way around, but luckily the store provides one. The store is such a landmark that Time Magazine pegs it as number four of the top ten things to do in Portland. That’s my kind of store. Powell’s boasts a very large science fiction section, a very small romance section, and a sort-of-small paranormal romance section. Science fiction romance is mixed in with SF. Among the store’s unique features are the pillars holding up the building. 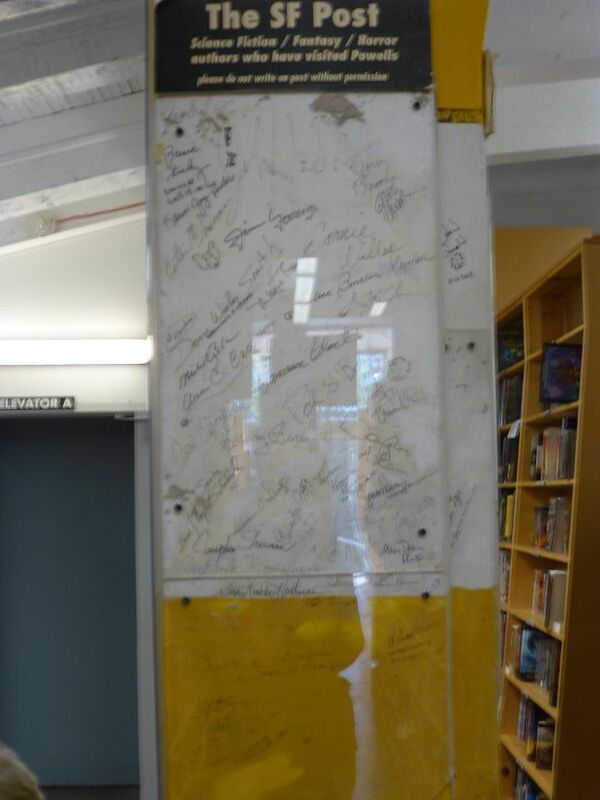 On one pillar, employees have listed Hugo winning books. On this trip, I bought two science fiction books by Julie Czerneda. The one I’ll read first is Ties of Power, which is book two in her Trade Pact Universe trilogy. I read book one awhile back but didn’t read on, for some now-forgotten reason. I’ll remedy the omission. I was privileged to meet Ms Czerneda at last year’s Toronto book festival. 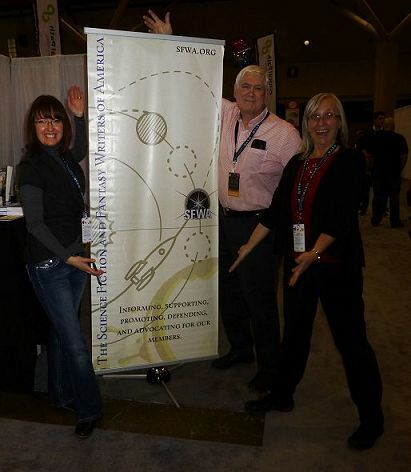 The two of us, along with author Karina Sumner-Smith, manned (womanned?) the booth for the Science Fiction and Fantasy Writer of America. Julie was humble and gracious, and I was delighted to make her acquaintance. 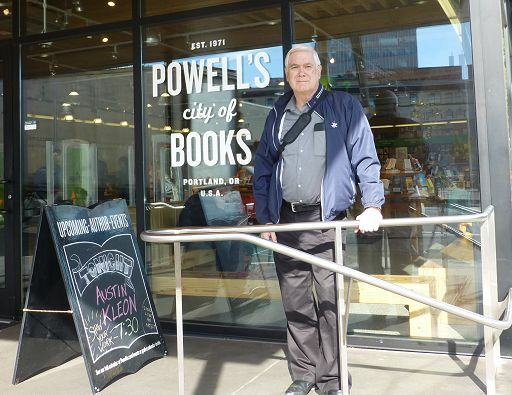 Next time you’re in Portland, check out Powell’s Books, and tell them I sent you. Check out other Bookstores I Love. What about you? What bookstores do you love? Great store indeed! My son would like to move to Portland. He’s so well established professionally in Toronto it’s hard for me to see him making the move, but if he does, the wife and I may yet end up close to Powell’s.